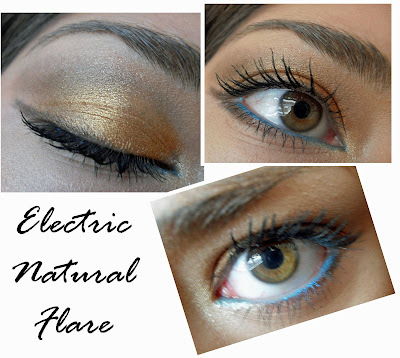 Today I couldn't wait to get my hands on Natural Flare, I did this simple everyday look with a pop of colour... The shadows are very easily blended and very pigmented, however you will have to make sure to tap your brush properly to avoid fallout when using a brush. I used my fingers, so I was OK! Do you have Natural Flare or are you planning on getting it? How do you wear yours? Ooooooh I love it! That's exactly how I plan to wear mine with a flash of green or blue and lots of bronzer. This is my fave FOTD from you!! My mum got it and about 10 other things that I am now in the process of stealing.. (once i can get to her make-up supply). She also bought the Porelain pink msf which i HAVE to check out in closer detail as she was glowing today. You look fantastic! And the new shirt looks really good too. @Tali thanks, well at least u have ur mums stash to get hold of :D borrow it once! it will look gorgeous on u! do you ever look bad hun???? Omg, you look super-super-super-stunning dear! I have natural flare too and wore it today, it's right up my alley.